“There’s something about Chicago that really stuck with me,” Gorillaz mastermind Damon Albarn mused while gazing out at the city’s skyline during his band’s performance at Northerly Island, recalling past visits to the Midwestern mecca. The influence of Chicago’s musical history—specifically the house music its clubs birthed in the early ’80s—pulses through the latest Gorillaz album, Humanz, with plenty of local talent contributing to the apocalyptic yet empowering LP. 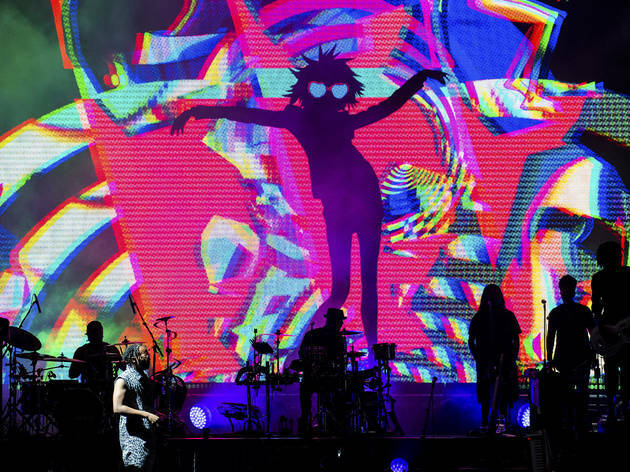 Celebrating the opening night of the Gorillaz U.S. tour (its first in more than seven years) in sight of the Willis Tower, Albarn and company paid tribute to Chicago by throwing a lakefront dance party attended by a cavalcade of special guests. The set began with a surprise appearance from rapper Vince Staples, who showed up to blaze through Humanz opening track “Ascension.” Flitting from hip-hop to funk to house, Albarn kept his expansive band (which included a six-piece choir) on its toes with a setlist that focused on highlights from Humanz, supplemented by a few choice cuts from the Gorillaz catalog. Though he often prowled around the stage clutching a microphone or conducting the choir, Albarn seemed giddy about ceding the spotlight to the cast of collaborators he assembled. After the initial dance party came to a close, Albarn and the band returned for an encore, providing a survey of some past Gorillaz hits. While Demon Days cuts like “Kids With Guns” and “Stylo” warmed up the crowd, the energy peaked when Albarn picked up his melodica and played the opening strains of “Clint Eastwood.” Reclusive rapper Del the Funky Homosapien showed up to perform the track’s tongue-twisting verses, as a crowd of thousands rapped along to what essentially amounts to a Millennial touchstone. Albarn's warning that "the future is coming on" was not unfounded, but Gorillaz have returned to meet modern times head-on with a live show that is joyously and purposefully looking forward.